Wow, I got to stamp yesterday! Emma and I were busy getting ready for Mark's birthday and I needed to make a few cards, so I just looked at the supplies that were laying on my table and said to myself "Self, why don't you use that and see what happens! Well, I took some Kiwi Kiss cardstock and cut it at 8 1/2 x 4 1/4 and folded it in half to make a square card. (I just love that size!) I attached a piece of Bella Rose DSP to the bottom half and stamped the sentiment in the corner. The phrase is from the Holidays and Wishes stamp set. I then took one of the pretty silhouette branches from Kindred Spirits (NEW in the NEW Catalog!) and stamped it on the top of the card in Kiwi Kiss ink. To finish it off, I cut a piece of Wide Chocolate Chip Grosgrain ribbon at 15" long and simply tied it around the front flap of the card, knotting it on the left front. Simple, elegant and easy! Those are the best cards to make! Hope you enjoy! Oh my goodness! You're killing me here! I was all resolved NOT to purchase this set! This is simple and beautiful! TYFS! Oooohhhh!!! Way too pretty! Wanna hear something funny? 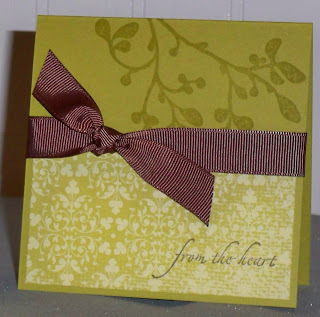 I used the same exact patterned paper and ribbon while stamping yesterday too. I'm gonna post that project on Saturday!! !